Irausk, Herald of Salvation is a boss that appears at the end of Mission 10: Sacrilege. He may pose a bit of a problem due to the many minions that appear. Irausk can be quite annoying due to his summoning of additional minions. He also has some homing attacks which can rip off a large chunk of your HP if you’re not kiting fast enough. However, he does have a weakness like any enemy: headshots. Using an up-and-close Super skill may not be the best idea due to the many additional minions that may interfere with your casting. Irasuk, the Herald of Salvation appears in Mission 10: Sacrilege. Irausk is a boss you’re going to have to learn how to kite. It’s about keeping the distance and making sure you don’t get smashed to pieces. 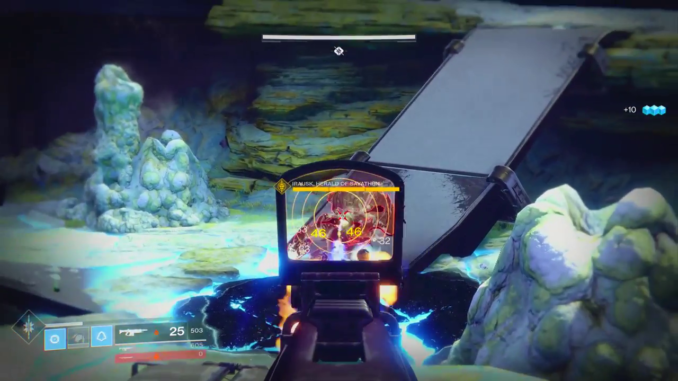 While fighting the Irausk, his main attack is a barrage of floating orbs. Don’t immediately move but wait for it to close in a certain distance. The orbs have a homing system which follows you if you dodge too early. However, players can also opt to use the higher platforms. But take note of the slopes, there are times that certain enemies will come in to knock off your aim. Once the adds come in, take them out first. Or, if you can cluster them together – use a grenade. The job class perfect for this particular kind of strategy are Dawnblades or Voidwalkers. Titan class players need to keep the barrier up. However, there’s no assuring that one of the homing orbs won’t move past the barrier off the bat. This at least allows you to back yourself into a wall, put a barrier in front of you, and take out the additionals. Hunter class players need to do what they do best: be slippery. As they have a lower health pool and also lower sustainability, evasion will be your best friend. Kite around while shooting while also prioritizing certain enemies. If you find a cluster of enemies, grenade them immediately to prevent yourself from being chased. Hide behind the obstacles as it will serve as cover. The main objective here is to outlast him as he has a large healthpool.